Public Relations UNJ 08/02/2019 Traffic accident is a form of a disaster that occur on the highway. There were 5400 recorded traffic accidents that occurred in Indonesia alone in 2018, and at least 55% of the accidents affect the millennials. This has become the main concern for Metro Jaya Regional Police Headquarters (Ditlantas Polda Metro Jaya). With many reports of traffic accidents that occurred last year, D Metro Jaya Regional Police Headquarters was encouraged to initiate a public lecture for the millennials on the importance of safe driving. UNJ is one of the locations chosen by the Metro Jaya Regional Police Headquarters to hold a general lecture with “Millennial Generation as Agents of Change in Realizing Security, Safety, Order and Smooth Traffic” as the theme. The lecture was held at the Maftuhah Yusuf Hall on February 1, 2019, and was attended by the Vice Rector for Planning and Cooperation Affairs, Dr. Achmad Ridwan, M.Sc, Police Great Commissioner of the Metro Jaya Regional Police, Yusuf, S.I.K., H., Hum, Head of DKI Jakarta DISHUBTRANS Control and Operations Division, Maruli Sijabat, and Transportation Expert, Ir. Ellen Tangkudung, all moderated by the Head of the Vocational Programme of Public Relations, Asep Sugiarto, M.Sc. 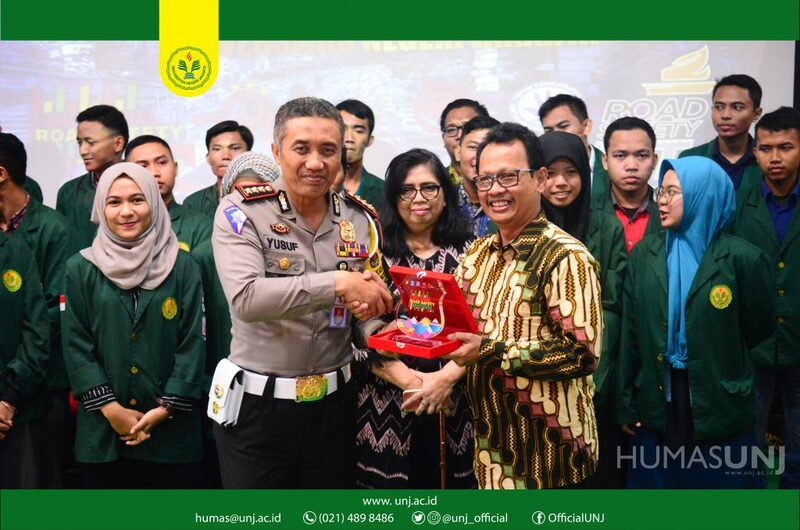 At the beginning of the event, UNJ’s Vice Rector for Planning and Cooperation Affairs said that this public lecture held by the Metro Jaya Regional Police Headquarters was a rare opportunity and had to be utilized properly. 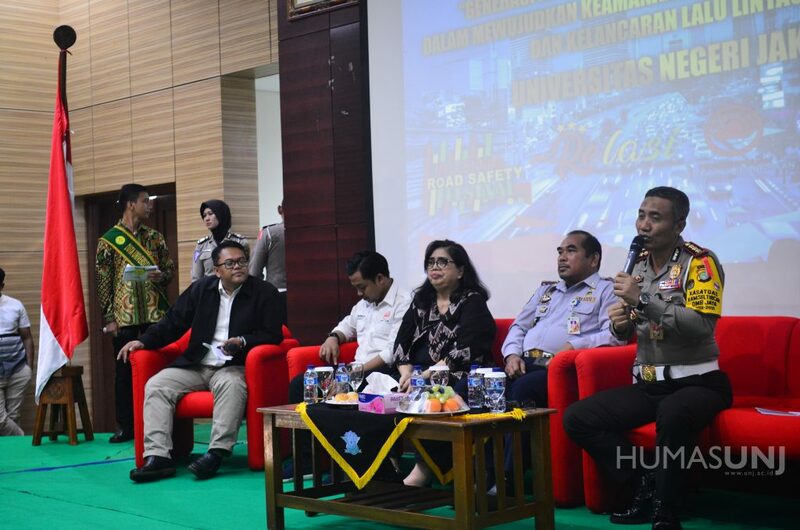 “In addition to being important for students who are predominantly motorists, this public lecture can also increase knowledge about driving in order to avoid traffic accidents.” The Police Great Commissioner of the Metro Jaya Regional Police, Yusuf, SIK, H., Hum. explained about millennial’s lack of awareness in driving safety. “Therefore, we from the Metro Jaya Regional Police conduct public lectures like this solely to reduce the number of accidents that continue to grow every year,” said the Great Commissioner. In addition to holding a public lecture, Metro Jaya Regional Police Headquarters also signed a collaboration with UNJ in the form of traffic education and inaugurations to students nominated as “Traffic Volunteers”. These Traffic Volunteers are expected to maintain security, safety, order, and smooth traffic.